Bernald Smith, younger (L), and then older (R). During the intervening time, he has contributed much of his spare time to advancing the sport of soaring and continues to do so - through SSA, FAI, OSTIV and many other soaring related organizations. These efforts have earned him almost every existing soaring award that exists. FAI's highest award - Lilienthal in 1993: "A lifetime of singular and unselfish commitment to soaring. 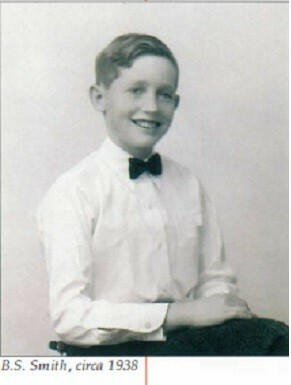 Smith's service is an inspiration to all who know him." 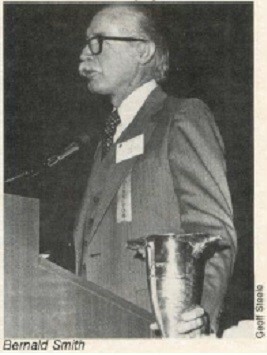 SSA's highest award - Eaton in 1977 and 1997 - the only individual to receive the award twice. His response in 1977 - "I can't believe it! I can't believe it!" In 1997 he thanked the people who have elected him to office saying, "I'd have paid to have them let me do it. We deal with great people in our sport." If anyone ever deserved it, Bernald Smith certainly merited the Schweizer Award which he received in 2002: "The Paul Schweizer Lifetime Service Award recognizes those SSA members who have made an exceptional, continuing contribution to fostering and promoting soaring over a period of at least three decades." As may be obvious from these three awards, Bernald Smith's contributions to our sport are far more than we can describe in detail here. We will try to tabulate as best as we can. Bernald Smith was first elected to the SSA Board in 1963 and became President of the Board in 1969 and 1970. He currently serves as Honorary Vice Chair of the SSA Board. 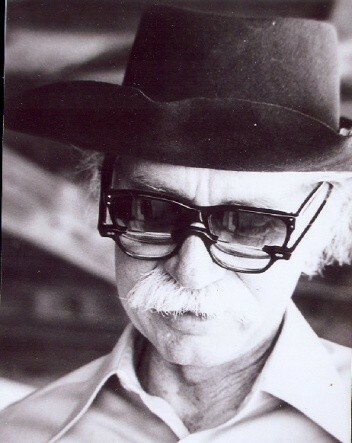 He was responsible for the successful 1970 World Soaring Contest in Marfa and served as a Steward for the Championships. He has served on and chaired many Boards for SSA for multiple years including the Technical and Publications Boards and the Insurance Committee. He has co-chaired several SSA Conventions held in Reno. He was Deputy Director of the 1983 World Soaring Championships in Hobbs, NM and Director of Championships for the 1991 World competition in Uvalde, TX. He has served as Trustee of the Soaring Safety Foundation. Over the years, Bernald has especially exhibited a strong interest in urging safety practices and has published many columns and articles on the subject. He was Trustee and President for the National Soaring Museum leading it through an important time in its history. At this writing, he is an Aviation Group Representative for the FAI Environmental Commission. As achievements outstripped badge goals for pilots, Bernald worked with others to create the World Distance Award for cumulated cross-country flight distances exceeding the circumference of the Earth. Bernald Smith's continuing contributions on the international level have been many with his efforts for both the FAI and OSTIV. He has been involved in the formation of GPS and its use in soaring and other aviation related activities. He was involved in the development of technical standards for avionics and support equipment. He has been a delegate and an alternate to the IGC and served as Vice President. As the U.S. Delegate to the OSTIV, he was instrumental in negotiating the agreement for publication of all OSTIV papers in Technical Soaring, a magazine which is now the OSTIV publication. He has been the SSA's and FAI's representative to RTCA; thus, serving all aspects of sport aviation. His many travels associated with these activities have always been at his own expense. He is recognized internationally for his lifetime of singular and unselfish commitment to soaring. The above list represent only a few of the activities with which Bernald Smith has been involved. He has served the SSA and the International soaring scene for over five decades. In addition to the Awards mentioned above, Bernald Smith has received even more recognition for his many efforts in behalf of the sport of soaring. Internationally he has received the FAI Bronze Medal in 2002 and the Tissandier Diploma in 1990. He is an FAI Companion of Honour and the recipient of OSTIV Special Recognition in 2008. He received the SSA Exceptional Service Award in 1970, 1975, 1982, 1988, 1991 and the Exceptional Achievement Award in 1996. 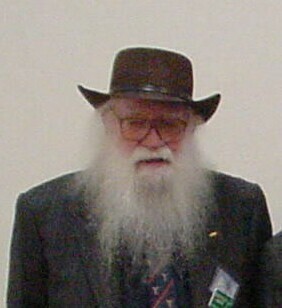 He gave the Barnaby Lecture in 2003. He earned the Silver badge #393 in 1960 and Gold #114 in 1962.